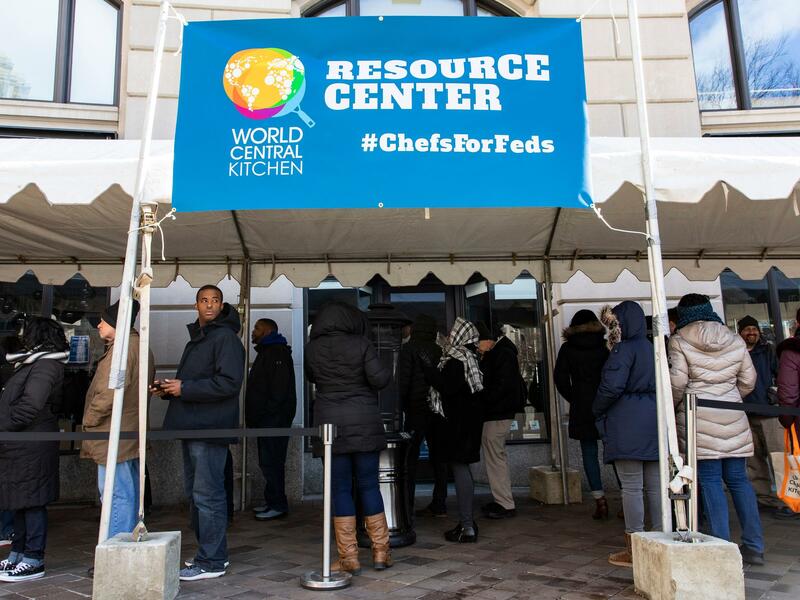 Federal employees wait in line at World Central Kitchen, a food bank and food distribution center established by celebrity chef José Andrés. The federal government is back open, but it could be several days before workers receive missed paychecks. "Some of them could get paid early this week," said acting White House Chief of Staff Mick Mulvaney on CBS's Face the Nation. "Some of them may be later this week but we hope that by the end of this week all of the back pay will be made up." While the reopening of the government and the expectation of getting paid are welcome news for many federal workers like Towanna Thompson, a program analyst at the Department of the Interior, a lot of trepidation remains. She says even though the shutdown is over, she will be on a budget because she knows the threat of another government shutdown is just weeks away. "I think it's stupid. Why are you going to open us up for three weeks and then have us go back and do this again?" Thompson asks as she is picking up lunch and groceries from World Central Kitchen, a food bank run by renowned chef and philanthropist José Andrés. It's located just blocks from the White House. "You know, Trump needs to wake up and smell the cappuccino," she says. She says she is putting off medical procedures until after Feb. 15, the day the current funding measure expires. Thompson is not alone in fearing another shuttering of the federal government. "We're still budgeting that we're not going to get a check until two weeks from now. And then a week after that we're shut down again," said Jared Hautamaki an attorney at the Environmental Protection Agency. During the shutdown, Hautamaki said he had been to food banks like José Andrés'. He also picked up extra shifts at Home Depot. And even though he is going back to work at the EPA Monday, he says he won't be cutting back on the extra shifts. "I plan on working as many hours as I can at Home Depot the next three weeks to prepare for the worst," he said. The measure to temporarily reopen the government did not include any of the $5.7 billion the president has repeatedly demanded for a U.S.-Mexico border wall. At the Rose Garden speech Friday announcing the end to the impasse, the president signaled another shutdown is an option if House and Senate negotiators don't come to an agreement he approves of. "If we don't get a fair deal from Congress, the government will either shut down on Feb. 15 again, or I will use the powers afforded to me under the laws and the Constitution of the United States," Trump said. In other words, declare a national emergency to bypass Congress and have the border wall built — a move almost certain to bring about a court challenge. Eric Ingram and his wife, Andrea Jensen, are both federal workers who live in Alexandria, Va.
Ingram works for the Federal Aviation Administration and took the shutdown saga in stride. "I guess it's cool to be part of history. That's nice," Ingram said. If he gives the impression he's laid back, it's because his wife, who works for the Department of Energy, has been on the job and — more importantly for them — has been getting paid. Jensen, though, said the shutdown has made her wonder whether it's wise for both her and her husband to work for the federal government at the same time. "It seems like there's more job security in not working for the same agency or having one person in private industry and one person in government," Jensen said. It's something her husband may consider down the line. But Monday is his first day back, and he's got a ton of projects to get up and running before the next possible shutdown. Today is the first day back at work for hundreds of thousands of federal workers across the country. President Trump signed a bill to reopen the government late Friday, bringing an end to the longest shutdown in U.S. history. Now, federal workers are worried. They could be out of work again in a few weeks if the president and Congress can't come up with a deal. NPR's Brakkton Booker reports. BRAKKTON BOOKER, BYLINE: Just a few blocks away from the White House, a food bank is set up for furloughed federal employees. UNIDENTIFIED FOOD BANK WORKER: Hey, how are you? UNIDENTIFIED FOOD BANK RECIPIENT #1: Good. How are you? UNIDENTIFIED FOOD BANK WORKER: Welcome. Welcome. BOOKER: All that's required to come in is a federal work badge. Yesterday's offerings included chicken torta and winter vegetable panzanella. UNIDENTIFIED FOOD BANK WORKER: Check your IDs inside. UNIDENTIFIED FOOD BANK RECIPIENT #2: That sounds good. UNIDENTIFIED FOOD BANK WORKER: Enjoy lunch. UNIDENTIFIED FOOD BANK RECIPIENT #2: Thank you so much for doing this. UNIDENTIFIED FOOD BANK WORKER: Hello. You check IDs inside. BOOKER: Here at World Central Kitchen, I meet Terri, a federal worker. She asked that we not use her last name because she's afraid her boss won't be happy with her when she shows back up at work. Can you tell me what you got in the bag? TERRI: I've got some fruit and some vegetables, and I've got my lunch (laughter). BOOKER: Terri works as a janitor at the Smithsonian here in Washington. Like many other federal employees, she's missed two paychecks as a result of the 35-day shutdown. She says two things got her through. TERRI: For me, it has been prayer and my family. If I had not been able to depend on my family, I probably would not have gotten through the past couple of weeks. BOOKER: She says the shutdown has been painful. Terri's not sure politicians though have any empathy for her or anyone else in the federal workforce. TERRI: My thing is I don't - I don't like being used. And that's what we feel like. We're being the ones pulled apart and plucked apart and left out to dry when these people that are making these decisions don't have the financial worries that we have. BOOKER: Terri wasn't getting paid, but she also didn't have to go into work. Duane Wilson did have to show up. He's a federal police officer at the Department of Homeland Security. He expects back pay soon. And another thing he expects - the government to be shut down again in a few weeks. DUANE WILSON: I personally feel like we're gonna be there. I think you have to - at this point, you have to assume the worst. BOOKER: The deal reached by Congress and the White House only keeps the government open for three weeks. It included none of the $5.7 billion for President Trump's U.S.-Mexico border wall. And when Trump announced the agreement from the Rose Garden, he showcased his willingness to shutter the government once again. PRESIDENT DONALD TRUMP: If we don't get a fair deal from Congress, the government will either shut down on February 15 again. BOOKER: Or, the president says, he will declare a national emergency to get his border wall - a move that will almost certainly be challenged in the courts. BOOKER: Hi. It's Brakkton from NPR. INGRAM: All right, great. I'll send my wife to come let you in real quick. Eric Ingram and his wife Andrea Jensen live in Alexandria, Va. Both are federal workers. Ingram works for the Federal Aviation Administration and took the shutdown saga in stride. INGRAM: I guess it's cool to be a part of history. That's nice. BOOKER: If it sounds like he's laid back, it's because his wife, who works for the Department of Energy, has been on the job and has been getting paid. Jensen says the shutdown made her realize something important. Maybe it's not wise for both of them to work for the federal government. ANDREA JENSEN: It seems like there's more job security in not working for the same agency or having one person in private industry and one person in the government. BOOKER: Her husband says that is something he's considering. But today he's heading back to work where he's got a ton of projects to get up and running before the next possible shutdown. Brakkton Booker, NPR News, Washington. (SOUNDBITE OF SOUND SCIENTISTS' "MAY 6") Transcript provided by NPR, Copyright NPR.